Have you ever seen a dog with three legs? They hobble around chasing balls and birds with their tails wagging happily, unconcerned by their apparent disability, but just focused on doing what dogs do best. They love life, never complain and have exactly the same attitude of dogs with four legs. In some way, most of us are three-legged dogs. We have ailments, issues and excuses that can hold us back… if we let them and give them too much power. How about instead of focusing on all of the problems and reasons why we can’t achieve our goals, we focus on doing what’s required to live a remarkable life. 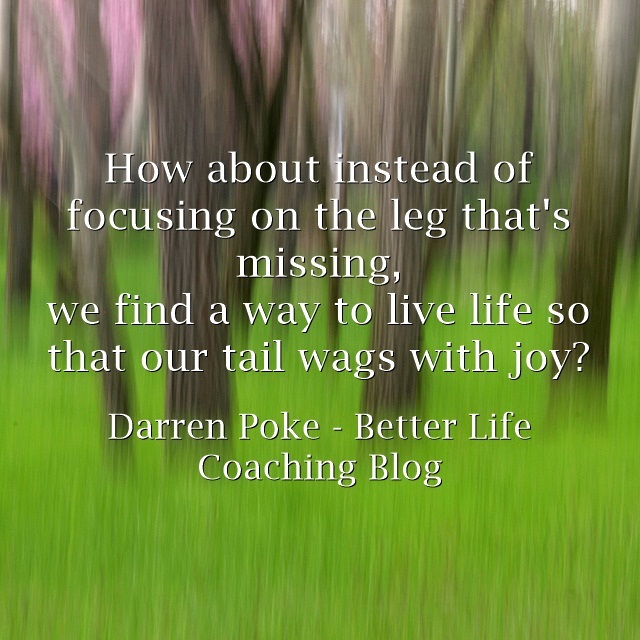 How about instead of focusing on the leg that’s missing, we find a way to live life so that our tail wags with joy? Previous post – Are You Avoiding or Embracing Uncertainty? Next post – Explore. Dream. Discover. « Are You Avoiding or Embracing Uncertainty?